ShumDario News describe their site as "the first and most complete source" for all the happenings with Harry Shum, Jr. and Matthew Daddario, following their work on Shadowhunters and their own projects. Pardon us while we dry the remaining tears from our keyboards for this next review as we look inside Shadowhunters Episode 3, “Parabatai Lost”. A heart wrenching emotional roller coaster from start to finish that has literally left us speechless as we contemplate the deep underlying themes of friendship, brotherhood, and love between two Parabatai caught in the middle of a desperate crisis. Themes were often woven into a tight braid where one cannot be so easily separated from the other. The bond has proven to be deeper and more complex than we originally thought. The episode opens with a flashback to a young and somewhat insecure Alec Lightwood meeting an equally young but already bold and confident Jace Wayland for the first time. Even in this short scene we can already spot the defining characteristics of their personalities as Jace demonstrates his prowess with a seraph dagger by throwing it into the bullseye of Alec’s archery target. Young Jace takes the opportunity to enlighten Alec by saying “It’s all about confidence. Once you believe you’re the best, you’ll be unstoppable”. Obviously wise words taught to him by dear old Dad. Alec seems instantly taken with his poise and tenacity. We then move forward to the present day where Magnus Bane is hard at work trying to keep Alec alive after his risky attempt to track Jace in the last episode which resulted in him slipping into some sort of coma. Magnus explains to Alec’s sister Izzy that “The Parabatai bond is like a tether that binds two souls. Jace and Alec share emotions, instincts, and strengths. It’s an Angelic bond” and his magic isn’t enough on its own to save him. Alec needs the missing piece of his soul that is lost somewhere between himself and Jace to cure him. So the hunt for Jace continues, but now with even more urgency as Alec’s life hangs in the balance. While caring for Alec, Magnus is interrupted by Jocelyn who comes to the door offering her help. Finally we see Magnus reach his breaking point allowing his frustration to come to the surface so he can speak his mind. Harry Shum Jr. does a fantastic job showing Magnus’ anger, not holding back to tell Jocelyn exactly what he thinks about her tactics and decisions. He also reminds her that he never wanted to get involved in Shadowhunter business in the first place, then slams the door in her face. We were cheering for Magnus in this moment as he unveils his deep level of caring for Alec as well as a willingness to protect him. It’s also interesting to see this vulnerable side since Magnus is usually the warlock everyone goes to for help. Now he must face his own feelings of helplessness since his magic isn’t enough to cure Alec. Once Clary returns to the Institute, Isabelle lets her know the state of Alec’s precarious condition. As they open the door to check on him, Magnus is still at Alec’s bedside very concentrated on the task at hand doing everything he can to save him. We see in several scenes his use of potions and magical remedies in addition to the glowing blue and white magic coming from his hands. Harry does a great job showing the emotions behind the lifesaving process as bits of Magnus’ frantic state bleed through. Slowly over the episode he unravels more and more as the panic sets in. When Victor Aldertree, acting head of the Institute, comes to Alec’s room to tell them their request for a transfer is denied Magnus’ anger is again unleashed. A combination of his frustration at not being able to save Alec coupled with his anger towards the Clave interfering with his attempts to keep Alec alive. Magnus loses control of the situation and lashes out with a never before seen red burst of magic to attack Raj, the Shadowhunter who threatened to remove Magnus from Alec’s side. Once Magnus is successful at transporting Alec from the Institute to his loft, we see a desperate sadness creep in as Magnus fears the worst outcome is eminent. His emotionally raw and vulnerable side brings tears to our eyes as Magnus is on his knees begging Alec to “Come back, come back. Please come back. I’m all out of answers, I’ve tried everything.” A powerful delivery by Harry again that is particularly gripping for the audience as the warlock succumbs to his helplessness with one last desperate move by attempting true love’s kiss. In the last scene of the episode, Jace is finally brought to Alec’s side as Magnus, Clary, and Isabelle witness Jace’s attempt at using the Adamas stone to reunite Alec with his lost fragment of soul. Reciting the Parabatai Oath line by line, with flashbacks to the original ceremony with teenage Jace and Alec, we were held breathless as we watched Alec gradually slip away and appear to die right in front of our eyes. This scene was so beautifully acted by Dominic Sherwood who is left shattered and crying, clutching Alec’s limp body and begging him not to leave him. The audience is no doubt heartbroken and battling a full blown ugly cry by this point, especially when the camera pans to Magnus revealing the tears streaming down his face. It’s almost too much to bear. Thankfully Alec regains consciousness in Jace’s arms and answers with the last line of the Parabatai oath. The two embrace, holding each other tight through thankful tears. We were so moved by the love between these two characters. Once again this week we’ve been blown away by how deep into the characters’ psyche we are going. The show is now even gifting us with beautiful flashbacks that bring even more layers and intrigue to our beloved characters. 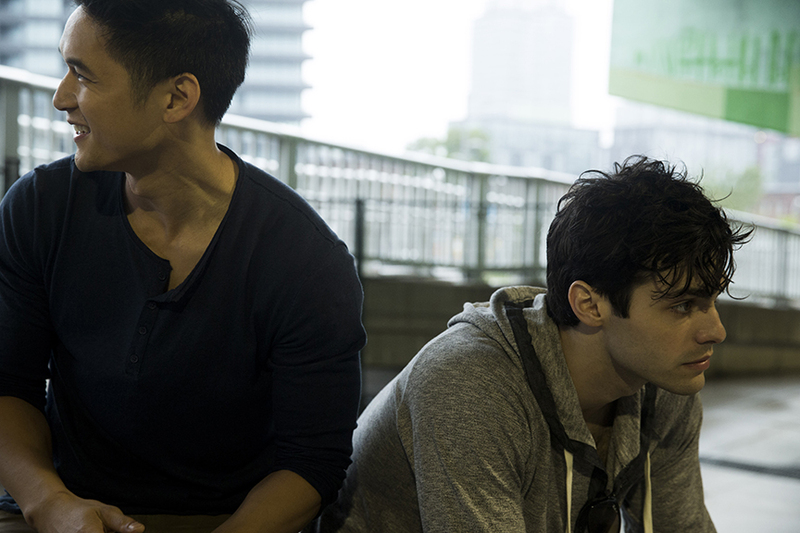 Both Harry Shum Jr. and Matthew Daddario are bringing their A games this season with flawless performances. Harry is capable of flooring us with only one look, and Matthew is astonishing even when asleep for most of the episode. Now that our favorite Parabatai have been reunited we cannot wait to see where the future is going with the fight against Valentine! Be sure to tune in every Monday night to watch the latest episode of Shadowhunters on Freeform.